Great guitarist, Jeff Golub was born in Akron, Ohio, USA on April 15th, 1955. Does anybody know the other players in the band, please? Jeff Golub was alumni in the famed Berklee School of Music in Boston. After graduation, he move to New York around 1980, soon finding a new job as part of Billy Squier Band. One question. Was Todd Sharp present in the whole tour? One question. Was Jimmy Roberts added to the lineup for the Japanese gigs in April 1994? Golub left Rod Stewart Band in 1994 to continue his solo career, first under the Avenue Blue monicker, later under his own name. Jeff Golub left the band in June 2004, as he didn't travel for the American leg of the tour, being replaced by Robin LeMesurier. Does anybody know if Matt O´Connor (percussion) was also part of the band, please? In the last years, Jeff Golub suffered a very complicated life regarding health problems. He lost his vision in June 2011, and after an accident in a subway station in September 2012, his health was still going worse. Doctors didn´t know what happened, and after many checks, he came with an atypical diagnostic, progressive supranuclear palsy, a fast irreversible disease. Finally, on January 1st, 2015, Jeff Golub passed away. He was 59. What a tragedy for such a still young, talented player. Rest in peace. Comments: Recorded live in September 1980. Comments: First solo album by Jeff Golub. Comments: Second album by Jeff Golub (first one under the name Avenue Blue). Comments: Recorded in January 2000. My opinion: Very nice album, comprising covers from different artists; mostly soul artists such as Marvin Gaye, Teddy Pendergrass, Smokey Robinson, but also covers by Van Morrison, Chris Rea or Average White Band. My favourite track are the great rendition of Eddie Harris´ tune ´Cold duck time´, also Van Morrison´s ´Crazy love´. Alex Al, Steve Barbuto, Andre Berry, Jim Biggins, Rick Braun, Scott Breadman, Curtis Brengle, Rocky Bryant, Clifford Carter, Luis Conte, Raphael De Jesus, Mark Egan, Steve Ferrone, Mitchel Forman, Steve Gaboury, Lincoln Goines, Ronnie Gutierrez, Bill Harris, Don Harris, Dave Hooper, Chico Huff, Jessy J, Ron Jenkins, Dave Karasony, Nick Lane,... up to 42 musicians. Comments: 2CD compilation with tracks recorded between 1977 and 1993, also including two tracks from Billy Squier´s previous band, Piper. Comments: Maxi single with the song ´All for love´ sung by Bryan Adams, Rod Stewart & Sting for The Three Musketeers soundtrack, plus one track per each of them. Comments: Compilation with 5 new tracks. 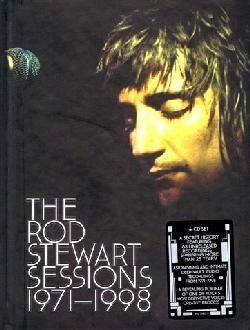 The old tracks are from Rod Stewart solo album plus some tracks from the Jeff Beck Group or Faces. Comments: Tribute album to Elton John and Bernie Taupin, featuring Oleta Adams, The Beach Boys (backed by Jerry Stevenson & Ian Lynn), Jon Bon Jovi, Kate Bush, Eric Clapton, Joe Cocker (with Phil Grande and Chris Stainton), Phil Collins, Hall & Oates (with T-Bone Wolk), Bruce Hornsby, George Michael, Sinead O´Connor, Rod Stewart (with Jeff Golub), Sting, Tina Turner, The Who and Wilson Phillips. Comments: A tribute to this great singer. Featuring tracks by Gladys Knight, Steve Winwood, Repercussions with Curtis Mayfield, Lenny Kravitz, Whitney Houston, Bruce Springsteen, Eric Clapton, The Isley Brothers, Brandford Marsalis And The Impressions, Tevin Campbell, Aretha Franklin, B B King, Rod Stewart (with Jeff Golub), Narada Michael Walden, Phil Collins, Stevie Wonder and Elton John And Sounds Of Blackness. Comments: It contains tracks by M2M, Britney Spears, Christina Aguilera, Billy Crawford (featuring Jeff Golub) and others. Comments: It contains tracks by Donna Summer, Alysha, Laura Pausini, Westlife, Youngstown (with Jeff Golub), Weird Al Yankovic, The B-52´s and others. Comments: Live DVD recorded in May 2003, featuring tracks by Yellow Matter Custard (with Paul Gilbert), Dream Theater, Vital Information, Shawn Pelton (with Jeff Golub), Airto Moreira, Antonio Sanchez and others. Comments: Live performances at the TV show by David Letterman, featuring tracks by: Jerry Garcia & David Grisman, Sheryl Crow, Lou Reed, Dave Matthews Band, Aretha Franklin, Paula Cole, Elvis Costello & Burt Bacharach, Lyle Lovett & Al Green, Van Morrison & Sinead O´Connor & The Chieftains, Jewel & Flea, Rod Stewart (with Jeff Golub), REM, Lenny Kravitz and Patti Smith. Comments: First solo album by German sax player Arno Haas. Comments: Fourth solo album by Kati Mac. Comments: First album by Paul Peress. Comments: Recorded during 1988 and 1989. Comments: Simply the best is a compilation (although it features tracks from only 3 different albums). The list of musicians is obviously quite similar to the ones in Private dancer, plus some others such as Rod Stewart (vocals), Jeff Golub (guitar), Eddie Martinez (guitar), Phil Palmer (guitar), Pat Thrall (guitar), Carmine Rojas (bass), T.M. Stevens (bass), Greg Mathieson (bass), the mythical Carol Kaye (bass), Richard Cottle (keyboards), Edgar Winter (sax), Plas Johnson (sax), Jimmy Roberts (sax), Phil Collins (drums), Art Wood (drums), and a long etcetera. There's also a reissue with bonus tracks, but I don't have it, so I don't know how many additional tracks contains. Chuckii Booker, Ivona Brnelic, Jack Bruno, Joel Campbell, Stacy Campbell, Timmy Cappello, Cynthia Davila, Martin Ditcham, Deric Dyer, Bob Feit, Lisa Fischer, Solange Geunier, Euge Groove, Ollie Marland, Warren McRae, John Miles, Kenny Moore, Karen Owens, Sharon Owens, Phil Palmer, James Ralston, Gloria Ruben, Steve Scales, Don Snow, Tina Turner,... up to 28 musicians.